Unfortunately, over time central heating systems and especially radiators are vulnerable to a build up of hard, thick sludge within the heating system and pipework. If left untreated, you could find that your boiler has to work harder in order to provide your property with enough heat. There are two popular ways for treating sludge in the central heating system. Professional plumbers prefer to use something that is called a Powerflushing machine. In effect, it’s simply a larger vacuum cleaner for your central heating pipework – its help to push all of the unwanted sludge out of the pipework. However, powerflushing machines are very expensive and the services themselves aren’t cheap. The best way to treat the sludge is by doing it yourself. You’ll need a basic understanding on plumbing and tools, but there’s no reason why you can’t get this done yourself. How do you know if your radiators have sludge in them? It’s actually quite easy to diagnose. Simply turn your central heating on full power and open up any TRV’s you have on your radiators. The TRV’s are the small valves on each end of the radiator with the small numbers. 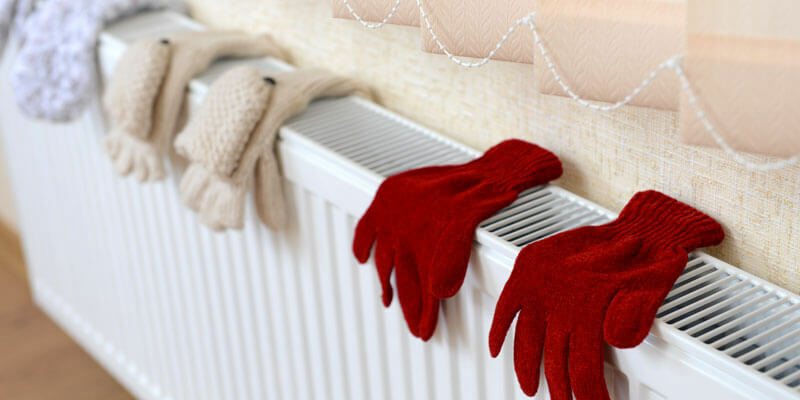 Allow the radiators to get hot and be careful, but gently feel the bottom of the radiator. If it remains cold after 10-minutes of turning the heating system on, then the chances of sludge being present are very high. However, if you notice that the bottom of the radiator is OK, but the top is staying cold; you might have air in the system. You’ll need to use a bleed key to release the unwanted pressure. Just remember to check the systems pressure after bleeding and top it up where needed. Before you can start flushing the radiator in question you’re going to need to close off any TRV’s and lockshield valves. This should be done at both ends of the radiator. Some radiators wont have the TRV’s installed – leaving just the lockshields present. That’s no problem; just make sure that the radiator is shut off and proceed to turning off the heating system. When you have closed off the radiator and heating system, you can open up the air vents (bleed valves) at the top of the radiator. This allows you to remove any unwanted pressure from the radiator prior to flushing it through. Opening up the air vents also provides a great opportunity to see how the radiator valves and lockshields are performing. After you have opened up the air vents, if water is still trickling out after 10-minutes; you have a problem. As a result, you might need to replace the radiator valves after you have finished flushing the system. Keep an eye on the air vents. When they stop running you can close the valves. You’re going to want to make sure that you do all of these parts prior to flushing the system. Unfortunately, if you don’t, you could make one hell of a mess. Place a large towel underneath the radiator to help protect it from damage and you protect your flooring from any water that might spill through. You will also need to place two large pans either end of the radiator, underneath the valves. Using a pair of grips and a spanner begin opening up the radiator valves and start to drain the excess water from the radiator. When the radiator is empty, start to slacken each valve and take it outside to complete the full cleanse. Trust me, you don’t want to be doing this inside! When you have the radiator outside, attach a large hose to one end on one of the radiator valves. The hose itself should fit comfortable over the spigot. Make sure that you keep the radiator upright and start to run the hose on full power, starting the flush of the system. If you can, point the other end of the radiator into an open drain so that the dirty water has somewhere to run. Keep the hose running to help clear the sludge from the base of the radiator – you may need to use a small rubber mallet to help the persistent sludge from moving. After a few minutes, simply repeat this process from the other end, using the opposite radiator valve. Keep flushing the water through until it runs clear. It’s worth flushing the air vents too – take this opportunity to give each radiator a thorough clean. You want to clear every valve you have available on the radiator. 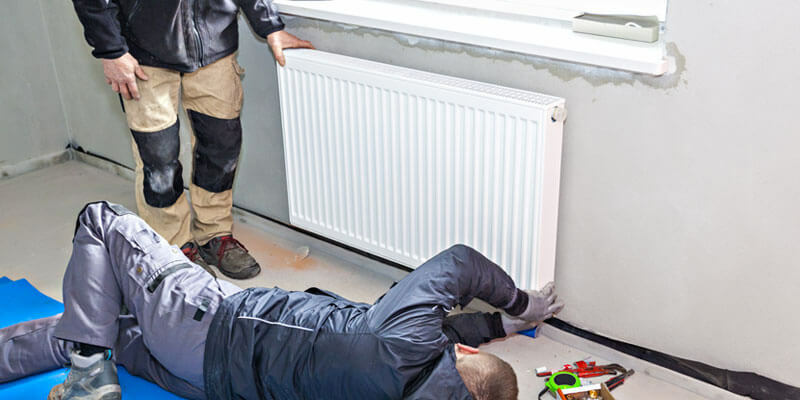 You should only think about re-installing the radiator when the water is running clear and you’re happy that the radiator is free from debris and sludge. Take the radiator back inside and place it on the wall. Start by fitting the air vents and radiator valves back into position and make sure that they have been opened up before you start turning on the system. When the valves have been fitted and opened, you can top up the pressure and switch the heating system back on. You might need to top up the pressure if you have a pressurised system – check your owners handbook for pressure settings. Why does sludge build up? When you have flushed your heating system and radiators, you should be wondering why it’s being allowed to build up in the first place. In most cases its simply because there isn’t enough inhibitor in the heating system. Most boiler installations in Milton Keynes will include an inhibitor, however, check with your local gas installer to see what is best for your home. Alternatively, you could look into the prospect of having a magnetic system filter installed. These act as a large magnet as withdraw the metallic debris that gets flushed around the pipes, preventing the sludge from building up over longer periods of time.